“community interest company” is a remarkably fluid, and I suspect broad category recognized by Companies House, the registry of companies in the UK. It resembles a charity in some ways, but with a different organizational structure. 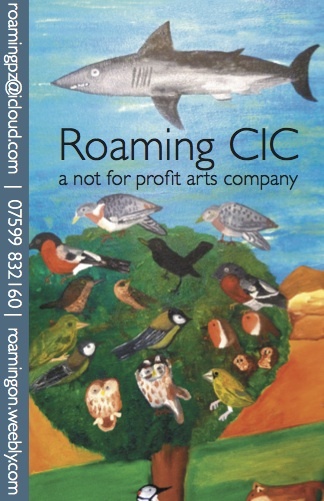 Roaming is a community interest company; Roaming Penzance is it’s main project at the moment, a weekly gathering of people in various kinds of difficulty–homeless, addicted, emotionally disturbed, who probably come for a variety of reasons, among them some respite from outside pressure to change their situation. Roaming works closely with St. Petroc’s, an organisation dedicated to helping single homeless people in the county. It matches people to living space available in the Penzance area (among the least affluent parts of the EU) and supplies basic needs: some food, showers, laundry, medical care. Roaming is the project of a friend and former student, Laura Wild, and I’m one of the directors. After a year or so, I’m gradually understanding what “roaming” means. It’s a kind of basic positive experience: it’s a moment when you’re awake and feel fairly relaxed and safe, enough to let go of goals and logical chains of connection and just go somewhere, make something, talk to someone, paying attention to what happens without judging it–at least not right away. It fosters a sense of not knowing what you’re doing, and not being anxious about it, either, of being open to genuine surprise.